Չապլինը «Որբություն» ֆիլմի ցուցադրությանը Մադրիդում 2007. ↑ 1,0 1,1 1,2 1,3 1,4 German National Library, Berlin State Library, Bavarian State Library et al. Record #129215112 // Gemeinsame Normdatei — 2012—2016. ↑ Kennedy, Dana. "Geraldine Chaplin: Living Among Ghosts in the Eye of the Storm". Associated Press. ↑ Reed Rex "If My Name Was Annie Smith". The New York Times. 10 December 1967. pp. x7. 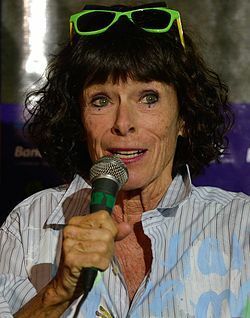 ↑ CINE-PREMIOS GOYA Geraldine Chaplin recibe Goya Mejor Actriz de Reparto. Spanish Newswire Services. 1 February 2003.